The Addressing Violence Against Women and Girls Through Football programme was a pilot funded by the UK’s Department for International Development (DFID) and the British Council in two locations (Kisumu and Mount Elgon) in Western Kenya. Known locally as ‘Kenya Timz,’ the programme aimed to reduce violence against women and girls (VAWG) through challenging harmful attitudes and behaviours using a sport-for-development model. Itad was commissioned to undertake an evaluation of the programme. 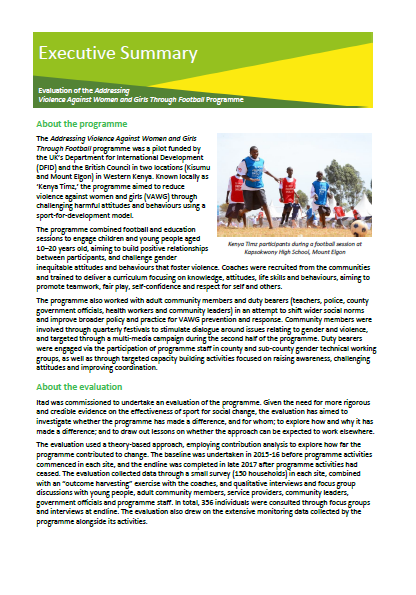 Given the need for more rigorous and credible evidence on the effectiveness of sport for social change, the evaluation has aimed to investigate whether the programme has made a difference, and for whom; to explore how and why it has made a difference; and to draw out lessons on whether the approach can be expected to work elsewhere. Find the monitoring tools from the Kenya Timz programme.